A table lamp made of cast brass, leg embossed Hagenauer Wien, WHW, made in Vienna, Austria. 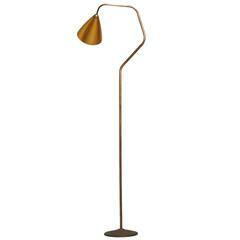 A brass floor lamp by Karl Hagenauer. Three joints allow for adjustable shape and direction. Patinated cast metal foot, brass tube, perforated metal shade, and white lacquered interior. 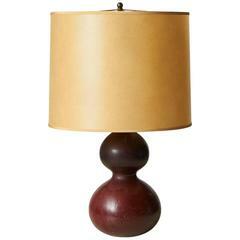 A double gourd shaped table lamp with a glaze in shades of brick and rose. Made by Axel Salto in the Royal Copenhagen studio. Signature etched on the bottom, Denmark, circa 1950. 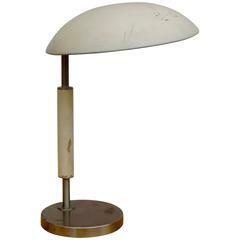 A table lamp in teak and brass, Lightolier #WM6198 by Gerald Thurston. Glass shade. Karl Trabert, G. Schanzenbach & Co. Frankfurt a.M.
Karl Trabert table lamp manufactured in the 1930s by G. Schanzenbach, Germany. Brass lamp shade inside white lacquered on a solid brass base, brown lacquered wood in between. 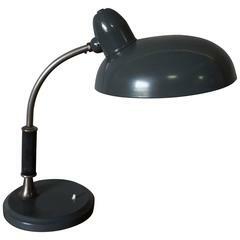 Art Deco table lamp in Hagenauer style, circa 1930s Polished and stove enameled Original shade. Art Deco industry lamp, Vienna, 1930s Original condition. Patinated steel, wood and shade in lacquered steel. Produced in Sweden, 1930s. Measures: Height 39 cm Diameter shade 27 cm Diameter base 14 cm. Free global front door shipping! 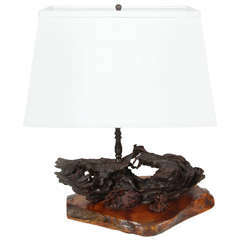 1930s table lamp made of driftwood all newly rewired and new custom linen shade. 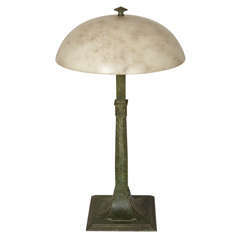 Beautiful table lamp in bronze and alabaster. Neoclassic style, in style of Villa Kerylos.